Our friends over at MakingStarWars.net have been in touch with one of their sources who has provided them with some information regarding the opening scenes of Star Wars Episode VII: The Force Awakens. This describes the scenes from immediately following the opening crawl of the film. Lots of this lines up with previous rumors, which leads me to think there's a good chance its true. 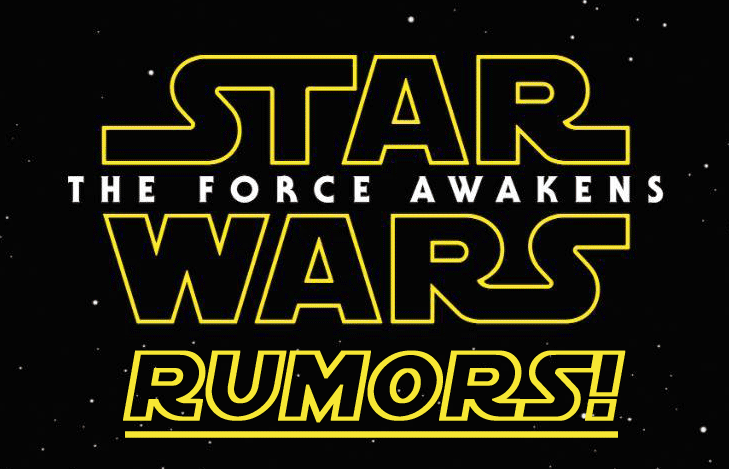 But, as usual, there's a chance these may not be true, but if you're trying to avoid all The Force Awakens rumors then stop reading now. This is your official SPOILER ALERT! The Vicar is most likely played by Max von Sydow. It is most likely a code name too. Chances are they didn’t need to name the character during filming so they just went with the title The Vicar which means leader or superior. Anyways, the Vicar appears to contact the Rebels and this brings Poe Dameron to the planet. As I mentioned at the top, the fact that this lines up with earlier rumors does make think there is truth to it (where there's smoke, there's fire, sort of thing). It does sound like an exciting opening act to the film, and likely some of the questions we have about this will be answered with the opening crawl, giving us context about how the galaxy far, far away has been for the last 30 years. I've been saying this since the day the floating lightsaber rumor started: This film needs to open with a ship flying somewhere after the crawl NOT a lightsaber. These rumors sounds like silly fandom to me. The Vicar ? My arse ! Sounds very interesting and different. At least there are no m___er f__k__g gungans! I for one have no expectations for this film. I want to thank Disney for giving everyone a huge white gloved force mind trick and obliterating the EU which had so many good stories and are now basically moot. The Star Wars saga was fine where it left off it told the complete stories of both the tragedy of Vader and the rise to power of Palpatine (Sheev give me a break) it was perfect and was fine where it finished. Disney can't you make your all mighty money on spin offs and merchandising which is apparent your starting already since any starwars item I've seen anywhere has the Disney logo all over it. I keep wanting to give this film a chance then I see articles like this and others with more disturbing news and get scared for the future of Star Wars. A floating lightsaber in space.. are you serious? I dont believe it. how did the lightsaber get off bespin (assuming its lukes old one). Regardless, how did it survive reentry and not smash into a zillion pieces upon hitting the ground..sounds lame, hopefully this is disinformation in an attempt to hide the true story while JJ tries to get the release moved up. Hmm. Well, I like the idea of the lightsaber setting the whole thing in motion, and believe this could be true ... but whether it all begins with it just coincidentally floating around in outer space just seems too ridiculous, even for science fiction. Having said that, the films historically begin with intense scenes in space directly after the 'crawl' ... I suspect this one will begin with a sequence involving the forementioned stormtrooper army (with Finn). Yes! We pretty much know there's going to be relic dealers in this story so it only makes sense. These stories are total bunk. Even the most gullible fans wouldn't believe the whole lightsaber surviving re-entry. It's a disinformation campaign. So a metal that can withstand the soaring heat of a focused light beam can't withstand re entry to the atmosphere?... are you people stupid? I think the SW franchise is losing credibility for a story based on real events or least those accounted in The Bible! I hope, if this is true, there is at least some sort of explaination as to how it traveled all the way from Bespin to Tatooine. Bespin has no ground so its plausible that it fell into space, less plausible however it ends up in tatooine rather than hoth, the closest nearby system. There is not going to be a lightsaber hilt floating in space and re-entering the atmosphere and crashing on some planet. So please stop whining about it. Maybe junk sweepers of some sort pick it up, maybe it was in a crashed ship, or maybe some relic dealer just has it and tells some cool tale about how he acquired it. I look forward to seeing Anakin's lightsaber in the movie still fascinating the future generation of characters. It's highly possible a light saber could survive atmospheric reentry. If an object has little sideways momentum relative to the atmosphere it will not heat up. The reason our current space ships do this is by design. It's called atmospheric braking. They could do the same thing but it would require tremendous amounts of fuel slowing down from an orbital velocity which currently isn't feasible. Couldn't they have simply used the Coke bottle prop from the film, "The Gods Must be Crazy"?